Bearded dragons eat a variety of foods, including life creatures and fruit and vegetables. But keeping live crickets on hand for your beardie can get noisy, and a tank filled with mealworms can attract other pests, such as moths. Prepared foods are easier to feed and can provide complete nutrition. 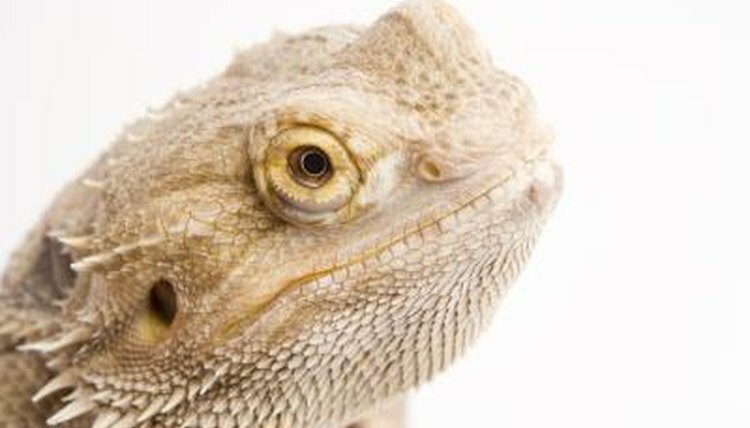 If your bearded dragon seems to prefer protein but won't eat greens, pellets can ensure he gets the nutrition he needs. Read the package, as each brand is different, and feed as instructed. Most brands require the pellets be soaked in warm water before feeding. Note that not all bearded dragons take to this form of food, but it can be a nutritious replacement to live insects and greens. Bites are bearded dragon food that's brightly colored and sweetly scented to be an attractive food source for your pet. They're a complete food source that contains all the nutrients your bearded dragon needs. They don't smell good to humans, but some beardies love it. But not all beardies will take to them. If your concern lies in keeping live crickets or superworms in your home, you can purchase canned insects for your beardie to munch on. These spoil quickly once opened. If the contents become watery, do not feed them to your bearded dragon. Choose from caterpillars, silk worms, wax worms, crickets, mealworms and others. You can also purchase prepared fruit in cans that have added nutrients. These canned food options are not complete diets, though. You will need to add fresh greens to the diet. Cleaned and chopped greens are in the produce section at any grocery. Another option is dried foods, which last for months after being opened. You can purchase specific insects or a mix. Some mixes contain freeze-dried insects as well as fruits and vegetables. Feed the mixes of insects and produce as a treat or as a complete diet option.